Google Earth is great. But the globe I had sitting on my desk as a kid wasn´t that bad either. I could touch it, swivel it around, easily understand the concept of the aquator and where I would have to live in order to experience an almost stable climate all year round. I could easily see why a country might be called “down-under” and some countries are supposed to be “on the other end of the world”. Best of all : I could turn on the light and watch our planet while falling asleep and dreaming of far-away places. Well these globes are still around. Not much as changed though, some magnetically “float” in the air, some are made from marble – you can even buy a waterball globe. I have collected some here. But, the concept of the traditional globe has been more or less the same for the past 30 years ago. Time to change that and introduce a new idea. My new concept for the smart globe 2.0 is driven by two major ideas and changes:. First, I suggest to use mini LEDs to light it. Not 2 or 3, not hundreds, but thousands to light up the Globe 2.0. Using these LEDs will allow much more variation than merely turning the light on and off and you can illuminate very very detailed areas on this globe, such as cities, rivers, counties and a lot more. 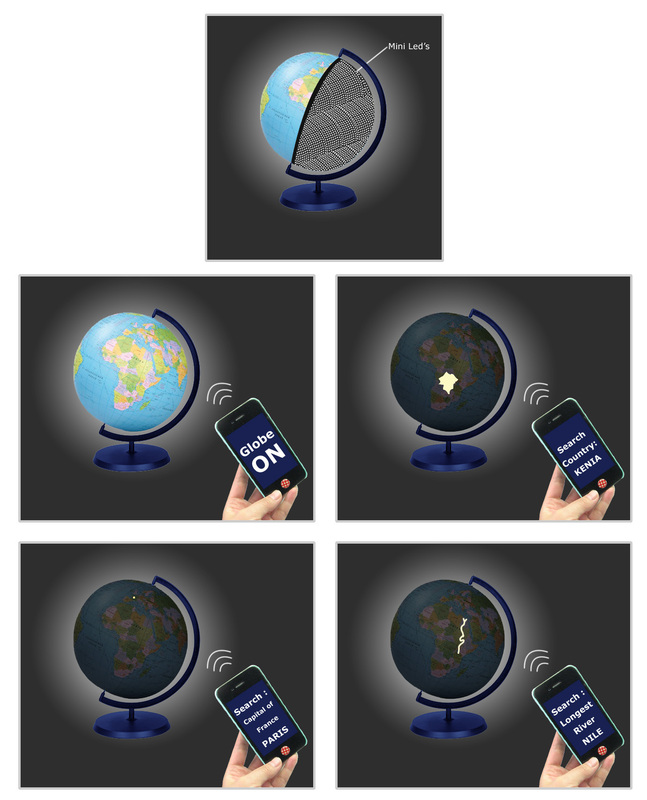 Secondly, I control the smart globe 2.0 by connecting it to a smart-phone through an app. This app includes hundreds of functions which in turn allow endless variations. show your child where mom or dad are on their business trip, or where the grand-parent or friends you met on your last holiday live. play games by searching for cities, countries, rivers or mountains and provide the solution by highlighting the results on the globe 2.0.